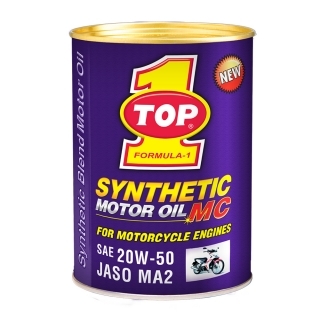 TOP 1 SYNTHETIC MOTOR OIL MC (SMO MC) is a premium quality 4-stroke engine oil engineered to meet the latest motorcycle manufacturers' warranty requirements. TOP 1 SMO MC is formulated using premium synthetic base oils and is fortified with our proprietary additive package. These special additives are designed to protect your motorcycle from buildup of deposits and to prevent wear imparted on your motorcycle caused by daily driving, whether in a congested city or an open country road. Exceeds API SJ and JASO MA2 specifications. Meets or exceeds the motorcycle manufacturer specifications: KTM, Aprilia, BMW, Harley-Davidson, Honda, Yamaha, Suzuki, and Kawasaki motorcycles that call for a 20W-50 oil. Engineered for severe riding conditions. Prevents wear of critical parts. Powerful detergent dispersants for engine cleanliness. Prevents deposits which cause power loss.